We compiled a list of every ABA Accredited law school, along with their latest US News & World Report ranking and their Law School Transparency employment score. 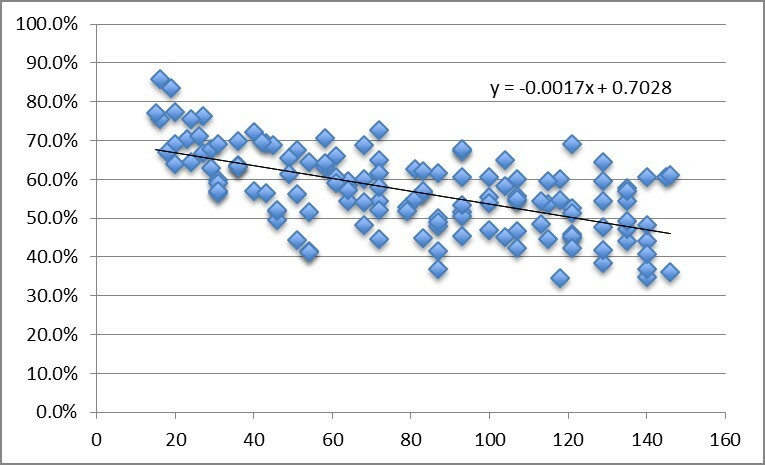 To determine which law schools are the most underrated relative to the above, we plotted this data (see below) and came up with a linear trend line, then measured each data point’s vertical distance from the trend line. This distance is also called the “Residual,” which you can see below for each law school. Positive residuals indicate that the school in question has a higher employment score relative to its ranking. The higher the positive number, the greater the discrepancy between ranking and employment score. Negative residuals indicate that the school has a lower employment score relative to its ranking. Some things to note: Unranked schools were listed as “150″ — below any ranked school — but this should not be taken to mean that these schools are necessarily cognates. Law School Transparency employment scores include all full-time, long-term, bar passage required jobs, excluding solo practitioners.This does include school-funded employment. To read more about what goes into the Law School Transparency employment score, visit their website to view the methodology.